Yes, sadly Spring is also when the fleas and ticks come out to play, too! 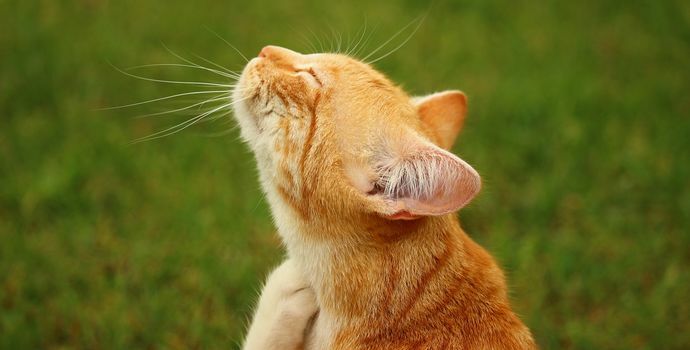 While fleas nowadays tend to be active all year round (due to our tendency to use central heating, kindly providing a nice warm house for our pets’ parasites), ticks are still very much seasonal. They are most active in the spring and autumn - when the weather is relatively warm and wet. While a few of the beasties may be active in a really mild winter, they really get going about now - so now’s the time to prepare to fight them off! To control the critters, we need to understand them… so in this blog, we’ll look at their life-cycles, and discuss different ways that we can disrupt and discombobulate them. Fleas are wingless insects; however, although they cannot fly, boy can they jump! The adults live on your pet, sucking blood - but unless there are LOADS of them, you probably won’t see them because they can crawl and leap away too fast. Infestations cause severe itching, and sometimes (especially in small puppies and kittens) even anaemia due to blood loss. The important things to remember about the flea life cycle is that the majority of it is spent away from the host - the dog, cat, rabbit (or human!). The adult fleas mate, and the female lays her eggs. These fall off the pet onto the floor, and there - in the carpet, soft furnishings, or the cracks between the floorboards - they hatch. The first stage is a maggot-like creature called a larva, which eats dust and (crucially) the droppings of the adults. When it has grown as much as it can, it weaves a chrysalis-like structure called a pupa. In here, the larva rebuilds and reorganises itself into an adult - and here it lurks, waiting for prey, perfectly protected from the outside world in its own armoured capsule. When air movements, warmth and vibration suggest a meal is wandering past, the adult hatches and jumps on board, ready to feed and breed. Obviously, it’s the adult fleas that cause most of the health problems (although the thought of all those maggoty larvae crawling around in your carpets and sofas probably makes your skin crawl!). Therefore, killing the adults with a suitable adulticide treatment is really important - and there are a wide range of products available, as sprays, spot-ons and tablets. That said, in general, the Prescription-strength medications are much more effective than those available over the counter, so do talk to our vets for advice about the best products for your pets! However, because only 5% of the flea population exists as adults at any one time, just killing the adults is a slow - and often ineffective - way of controlling an infestation: environmental control is needed as well. This may be by medications, such as lufenuron, selamectin or S-methoprene that damage or kill the larvae and eggs; or by Decontamination. This involves using insecticidal sprays on carpets and soft furnishings to kill the larvae, and regular vacuum cleaning to trick the pupae into opening, so they can be killed as well. Adulticide (a product that kills the adults). Environmental Control medications (these are often combined with the adulticide, and the same effect can sometimes be achieved by using a product that kills the fleas so fast they don’t have time to breed). Environmental Decontamination (vacuuming and using insecticidal sprays). Repel - some products containing permethrins will repel ticks, making the animal less appetising to them. These are great in dogs, but most must NEVER be used in cats, as most permethrin products are lethally toxic to felines. Kill - any product that kills the tick before it can pass on the infection will help to keep your pet safe. There are spot-ons, collars and tablets that all kill ticks very rapidly. In addition, carefully checking your pet for ticks at least once a day is really important, because no drug is 100% effective against the nasty beasts. If you find any, use a tick hook to gently twist them off and then kill them - never try to burn them off or pull them off, as this can leave the head behind (causing infection) or cause the tick to vomit into your pet’s bloodstream (spreading the infections we’re trying to avoid). If you want advice on flea and tick control, do come and speak to one of our vets - they’ll be able to help you select the control measures that are right for your pet as an individual! Have you thought about joining our Pet Health Plan? It provides your pet with all antiparasitic treatments and vaccinations (including Kennel Cough for dogs), for one monthly fee - saving around 15% on in-practice prices. There are also discounts on consultations, dentals, food and accessories in practice. Please get in touch if you’d like to learn more!